Wilfried Imrich, 8700 Leoben, Österreich. For a list of misprints and notes click here. For downloading software (implemented algorithms) click here. If you have comments on the book or questions, please feel free to contact us under the email address rhammack(at)vcu.edu, imrich(at)unileoben.ac.at or sandi.klavzar(at)fmf.uni-lj.si. 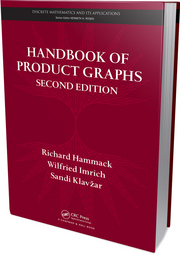 Handbook of Product Graphs, Second Edition examines the dichotomy between the structure of products and their subgraphs. It also features the design of efficient algorithms that recognize products and their subgraphs and explores the relationship between graph parameters of the product and factors. Extensively revised and expanded, the handbook presents full proofs of many important results as well as up-to-date research and conjectures. The second edition of this classic handbook provides a thorough introduction to the subject and an extensive survey of the field. The first three parts of the book cover graph products in detail. The authors discuss algebraic properties, such as factorization and cancellation, and explore interesting and important classes of subgraphs. The fourth part presents algorithms for the recognition of products and related classes of graphs. The final two parts focus on graph invariants and infinite, directed, and product-like graphs.